The rise of architectural and design-led gyms and wellness studios have us all dreaming of trialling some new form of exercise, and many gyms around the world have collaborated with design houses and architects to give us the opportunity to do just that. These spaces look good on the outside and on the inside, after some hard work, and you’ll definitely gain something from the amazing gyms and studios designed for both function and inspiration. Here are a few gyms that grabbed our attention. The newly-launched Warehouse Gym in the Dubai Design District tops this list. When award-winning VSHD Design came onboard for the project, the results were destined to be breathtaking. VSHD successfully delivered a fitness facility that will surely be a prime destination for design, art and culture. 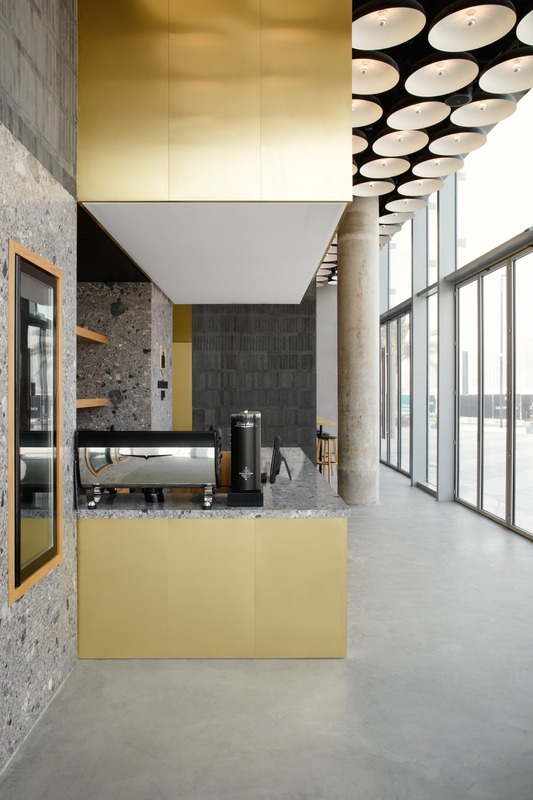 Successfully combining functionality and sleek design, VSHD’s work on Warehouse Gym in D3 is equally aesthetically pleasing and inspirational, characterised by its concrete bricks paired with contrasting gold-copper alloy. Upon entering the contemporary space, you are greeted with a juice bar designed as a communal area, enticing onlookers from the main street with its 17-meter-long glass façade, giving you a taste of the ambience of the gym. While the space is made up of three separate single-purpose rooms, there is a seamless flow which allows each space to open onto another. A semi-transparent elevated cube centres the gym, which, when lowered, transforms the three surrounding sections into one largely impressive gym floor, ideal for accommodating the masses. If you happen to find yourself in Paris, La Belle Equipe cannot be missed. An intimate yet considered space which gives you the impression you have stumbled upon a designer boutique in Le Marais. The light wood finishes and comfortable chairs in the entrance instantly evoke the retro-artisanal spirit and invite you to participate in their private and semi-private Thai boxing classes. You can enjoy a freshly pressed juice for all your efforts afterwards and freshen up in their bright and relaxing cloakrooms. They recognise the importance of personal development alongside your physical goals, and subsequently deliver holistic wellness that doesn’t just involve the physical pains and aches that you might experience after a long boxing session. If you’re looking for something more sleek and modern, the acclaimed Third City Space in London is combining high-end luxury and innovation like no other. You can choose to go to the pool, with the bronze-angled mirror-finish ceilings that reflect the light as you swim, which keeps the water constantly purified using natural light. If you’re looking to train, they offer an impressive 8,000 square-feet of open gym space, a high-intensity studio with immersive lighting and surround sound, or a specialised combat area with padded walls that can be a dojo or a boxing training zone. When you’re done, you can head to the changing rooms through a walk-in dryer, so you don’t have to shed another drop of sweat on their fluffy Cowshed towels. Going to Third City Space, you can certainly be proud of sharing your performance on a leader board, so you can compare your efforts and push yourself to the next level. A little closer to home, Melbourne and Sydney yoga studio, Humming Puppy, is making waves. Together with the world leading acoustic engineers, ARUP, they have created a space that quite literally ‘hums’. Injecting high frequency sounds into the space allows bodies in the space match these frequencies. The higher the frequency of your vibration, the lighter you feel in mind and body making room for a focused yoga class. The spaces themselves thrum with good, natural vibes, either from the soft lighting and smooth wooden interiors in Prahran, or the green accoutrements of the slightly retro-industrial studio in Redfern. As we are introduced to new developments nearly every day, it’s no secret that gyms and wellness centres are quickly becoming playgrounds for designers and innovators, and we are all about the new spaces where we can safely and properly commit to being fit and healthy. The competition is only becoming more exciting, and the Casper & Casper team are excited to see who will top this visually-pleasing and top-performing leader board.